That, according to senior White House advisor Kellyanne Conway, will be the overarching theme of President Trump's State of the Union, which is expected to begin at 9 pm ET on Tuesday. Last year's speech was distinguished by Trump's calls for cooperation between the two parties during an 80-minute marathon that was the longest speech since the Clinton administration. Of course, Trump's heartfelt speech did little to change the atmosphere of bitter partisan acrimony that has only intensified in Washington over the past year. But after a divisive year that featured partisan battles over the confirmation of SCOTUS Justice Brett Kavanaugh, Trump's zero-tolerance border policies and - most recently - the government shutdown, according to Conway, Trump is once again planning to strike a conciliatory tone to try and silence critics who joke that his speech would be more aptly referred to as "the State of Disunion". "This president is going to call for an end to the politics of resistance, retribution and call for more comity," Conway said, spelling out the last word. Many of President Trump's recent decisions have been controversial among both Republicans (the trade war, his decision to pull troops from Syria and Afghanistan) and Democrats (immigration, the wall, the shutdown). And as the president seeks to rally support as the 2020 campaign season gets underway, previews of the speech published by the Hill, the New York Times and NBC News suggest that Trump will spend the bulk of his time touting his victories and selling his policies to the public, while calling for Democrats and Republicans to find common ground on issues like passing a sweeping infrastructure bill. The "optimistic" tone will go a long way toward setting out Trump's goals for the coming year. Immigration policy dominated the president’s agenda during his second year in office, and most likely will again during the third. Mr. Trump has consistently tried to make the case that there is a “crisis” - of crime, drugs and human trafficking - at the border with Mexico, an emergency that can be dealt with only by building a border wall. The president is also likely to call for a legislative solution to address the so-called Dreamers, younger immigrants who were brought to the United States illegally as children and have no criminal record. This is one area of possible cooperation with Democrats, but there are significant disagreements about details. Mr. Trump is not expected to veer from his demands for billions of dollars in funding for border security, including some kind of barrier. Congressional negotiators from both parties are trying to hammer out a deal on border security, but Democrats have been adamant that they will not agree to money for Mr. Trump’s wall, and the president has been pessimistic about the chances of Capitol Hill coming up with an agreement that meets his approval. Still, he is not expected to use the address on Tuesday to declare a national emergency, which potentially would enable him to construct additional barriers along the border using presidential authority. Trump is coming to Congress during crunch time for budget talks, with a Feb. 15 deadline to avert another shutdown. In the lead-up to the address, Trump has slammed bipartisan negotiations as a “waste of time” and chastised Democrats for opposing his demand for $5.7 billion in border wall funding. The president and his aides have instead hinted he may use Tuesday’s speech to lay the groundwork for declaring a national emergency that would allow him to sidestep Congress and build new portions of a wall along the U.S.-Mexico border. Trump told reporters last week when asked about the declaration to “listen closely” to the upcoming speech. But a senior administration official who previewed Trump’s remarks on Friday would only say that immigration will be “the top priority” of the address. A declaration would likely spark a political backlash by riling Democrats and even some Republicans. Senate Majority Leader Mitch McConnell (R-Ky.) has reportedly warned Trump privately that such a move could divide his own party. There’s also the near certainty of legal challenges to declaring an emergency. The senior administration official said Trump, “in a spirit of trying to reach across the aisle to advance the interest of all Americans, is going to try to provide a bipartisan way forward” on the immigration stalemate. Trump has been fighting the Washington foreign policy establishment over his plans to withdraw troops from Afghanistan and Syria. Most Republicans and many Democrats in the Senate have voted against a "precipitous withdrawal" from either country, but the Democratic presidential candidates found themselves siding with Trump - even if they disapproved of his methods and perceived motives - on the basic premise of winding down the U.S. presence on both fronts. Tuesday's speech is an opportunity for him to make his case to Congress directly and to the viewing public at home. "We've been there for 19 years, almost, we are fighting very well," he said of the Afghanistan war in an interview with CBS that aired over the weekend. "We're fighting harder than ever before. And I think that they will - I think they're tired and, I think everybody's tired. We got to get out of these endless wars and bring our folks back home." 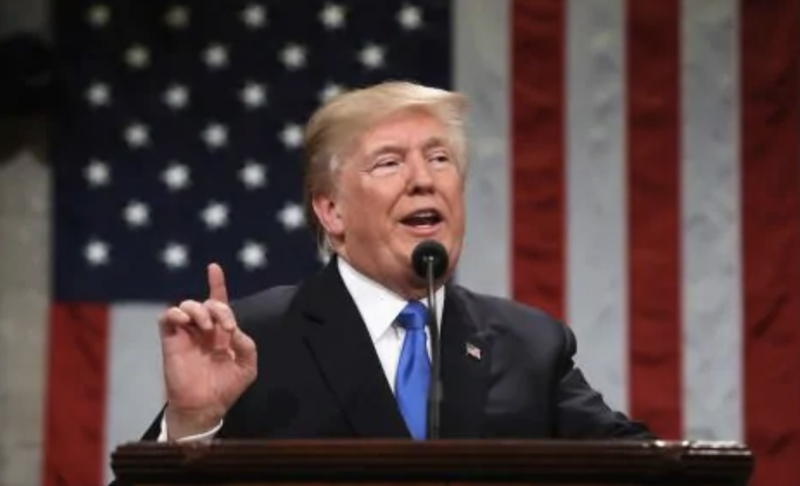 President Donald Trump plans to use Tuesday night’s State of the Union address to promise an end to the HIV epidemic in America, four individuals with knowledge of the planned remarks told POLITICO. Under Trump’s 10-year strategy, health officials would target the U.S. communities with the most HIV infections and work to reduce transmissions by 2030. The strategy has been championed by top health officials, including HHS Secretary Alex Azar and CDC Director Robert Redfield. Trump is likely to tout his administration’s long-awaited proposal to end a complex system of drug rebates that’s been blamed for helping keep prices high. The measure, announced on Thursday, could hand the president a potential win on drug pricing if passed. Besides directly targeting middlemen like pharmacy benefit managers, the policy is a “clear negative” for makers of expensive drugs that use rebates to fend off competition from cheaper alternatives, said Veda Partners analyst Spencer Perlman. Sell-side analysts at Wall Street firms had mixed reactions as health-care supply chain stocks fell on Friday. White House officials said the president is also likely to talk about abortion and the “fundamental importance and respect for human life.” Mr. Trump’s evangelical supporters, who fervently oppose abortion, have been the bulwark of his political base. He might also talk about China’s program of forced abortion and sterilization, and perhaps even efforts in the United States to ease some abortion restrictions, such as a contentious amendment regarding late-term abortions being considered by the legislature in Virginia. The president, as he did last year, will almost certainly make an appeal for an infrastructure program, and is likely to emphasize its effect in rural America, the home of his political base. Programs to repair roads and bridges have strong bipartisan appeal, but so far, Republicans and Democrats have not found a middle ground. Another major announcement Trump has teased is a second nuclear summit with North Korean leader Kim Jong Un. Trump told CBS News on Sunday that the meeting "is set" and that he would reveal the details "probably" during the speech "or shortly before." "There’s also a very good chance that we will make a deal," Trump said of the planned summit with Kim, which is expected to take place this month. The president could use part of his address to try to win over skeptical lawmakers, who heard from Trump’s own intelligence chiefs last week that North Korea is unlikely to give up its pursuit of nuclear weapons. One highlight of every SOTU is the guest list, as president's typically incorporate the stories of every day Americans into their elucidation of their policy goals. This year, Trump's guests will include an 11-year-old boy named Joshua Trump, who has reportedly been bullied because of his last name, Grace Eline, a child who was diagnosed with a brain tumor when she was 9; Judah Samet, a survivor of the Holocaust who lived through the shooting at Tree of Life synagogue in Pittsburgh; Ashley Evans, a recovering opioid addict; Elvin Hernandez, a special agent at the Department of Homeland Security who focuses on human trafficking; and Debra Bissell, Heather Armstrong and Madison Armstrong, family members of a Nevada couple who authorities say were killed by an undocumented immigrant, the Washington Post reported. Given that this will be Trump's first SOTU with Nancy Pelosi standing behind him while Trump speaks from the House rostrum - and with a handful of lawmakers hoping to unseat Trump in 2020 sitting in the crowd - particular attention will be paid to the Democratic response. The official rebuttal will be delivered by Stacey Abrams while Bernie Sanders will once again deliver a rebuttal of his own.